Note that readers could buy the paper models for the plates. I’m guessing some have survived. Or am I hopelessly optimistic? If you’ve seen any, please tell us about it. Our Fashionable Readers should know, that the drawings of the fashions are made from beautifully-formed paper models, which may be seen and purchased—as, for the purposes of the Magazine, they are useless after the copies are published. 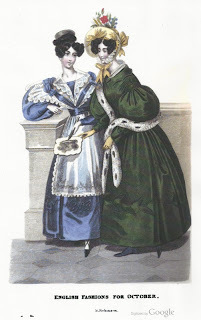 Of lavender gros de Naples; the body is made half high and full; the skirt has a hem about one quarter of its depth, cut out on the top in leaf-like dents of five divisions each, and edged with piping. Over this dress is worn an apron and canezou of embroidered muslin. The canezou is made without fulness in any part, divided on the shoulder, where it falls in two deep and rounded lapels, and is open in front, with a narrow collar, which diminishes in width as it reaches the waist in front. This canezou is confined to the shape by braces of gauze ribbon matching the dress, which are gathered up into coques on the shoulders, and fastened behind with a short bow. Of olive green gros des Indes. The body is slightly fulled across the bust, and plain behind, and is finished at the throat by a small collar very slightly indented at the edge. The skirt is set on in bunches of folds alternately reversed; its trimming consists of long curved dents cut out from the top of the hem; they are edged with rouleau, and are made to form a wreath by turning down one and leaving one upright. The sleeves are set on like the skirt, in alternately-disposed folds; they have a cuff at the wrist, which has a trimming similar to that of the hem, but much smaller. Hat of Tuscany straw, trimmed with field-flowers and ears of wheat. I am in awe of the skills of the seamstresses who made these dresses. How many woman-hours do you suppose it would take to do the hem on that green dress? There are some pictures of paper fashion dolls on the Victoria & Albert Museum webstite. A friend told me of: 19thcenturypaperdolls.weebly.com/paperdolls. I remember having cut out paper dolls to dress as a child. Lil, long hems are very, very quick to sew. I played cello all through school and sewed two full-skirted gowns every year, pastel for spring and black for the fall/winter concert series. It takes longer to turn the hem up with an iron than to do the hand stitching. Both tasks are easily done in an evening. People who do piecework have a very different perspective. The socks I knit for my husband average 18,000 stitches PER sock. You really don't want to know how many knots are in a yard of relatively plain tatted lace.